The 2nd Edition of Mining the Social Web has officially soft-launched (the “hard-launch is at my Strata workshop next week), and as of late last week you could download either a PDF file or view an ebook excerpt of the first chapter that introduces data mining with Twitter’s API. Additionally, as of just a few hours ago, the full-text of the first chapter is now also available as an IPython Notebook (ipynb) file! 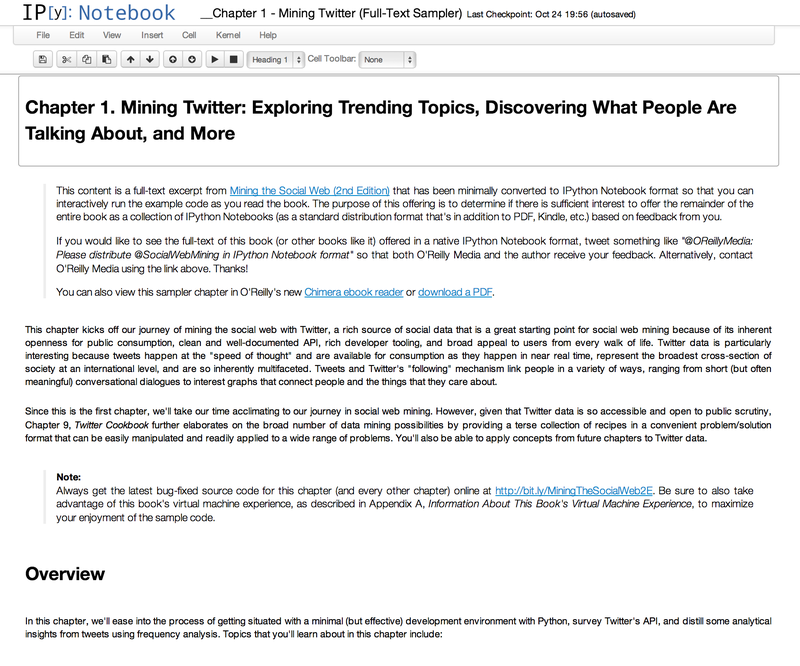 Enjoy the full-text of Chapter 1 (Mining Twitter) as an IPython Notebook! If you’ve been following this project at all, you already know that there’s a turn-key virtual machine that provides all of the sample code from the book in a convenient and interactive IPython Notebook format, so that you can get right to business without so much fuss around Python configuration management and Python development tools. With most of that foundation in place, I then began wondering why the entire text of the book couldn’t be offered in that same convenient format. What makes an IPython Notebook distribution particularly exciting is that it’s such a natural experience to read and interactively execute code examples within the same user interface. While perhaps not everyone would want to consume the book as a collection of ipynb files, there’s certainly a lot of value to be had by offering it as an additional option beyond the standard ebook formats. What makes an IPython Notebook distribution particularly exciting is that it’s such a natural experience to read and interactively execute code examples within the same user interface. After a few late nights of XML hacking and a series of conversations with some innovating folks at O’Reilly, we’ve decided to offer the sampler in IPython Notebook format to find out whether there is in fact really demand for an IPython Notebook distribution. If the feedback is substantially positive, then there’s a reasonable chance we’ll find a way to offer the full text in IPython Notebook format. You should definitely leave a comment or tweet your support with the sidebar widget (and mention @OReillyMedia) if this is something you’d like to see happen with this book or any others. Enjoy, and know that I’m always here coveting your honest feedback, especially in the form of thoughtful book reviews. err, minor bug report; the file linked to with that bit.ly link is not an .ipynb file, it’s an html file that was captured from an ipython session. It does seem like a very good way to deliver technical content, especially since ipython magic extensions mean you can support languages other than python in an ipython session. This really is the third blog post, of urs I actually browsed.